The hanging racks are full of colourful souvenirs. 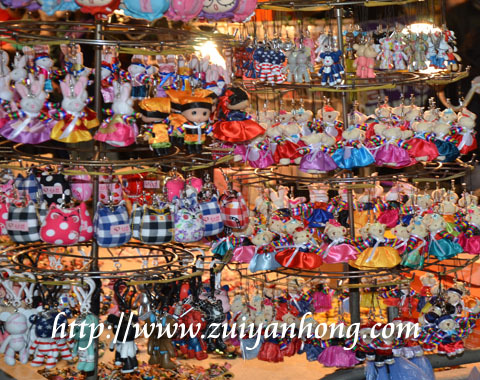 Various varieties of cute souvenirs are available. Tourists stop at the stall and look for their favourite souvenirs. These different types of souvenirs include key chains, mini purses and mobile phone accessories. You can bargain with the vendor for the items you want to buy. The prices of the souvenirs are not expensive and do not occupy too much of the suitcase space. You can keep them or give children.